The Winter Storm Warning started at 6 p.m. Friday, and Shaun Gallagher was out in TMJ4's Storm Chaser. Most would have thought Wisconsin would have been snow covered by mid-January but Mother Nature's late start has brought mixed emotions. For those who depend on snow for business, they're excited for a few inches of snow. At The Rock Snowpark, they've been able to create their own powdery surface since Thanksgiving. However, in the last few weeks, it's been cold enough that they didn't have to add anything to the snow pack they've created. With what's in store for this weekend, it's not the actual snow they need, but the people to be inspired when they look out the window. "It helps people think, it's winter and believe it's winter," Nicole Zignego, GM of The Rock Snowpark said. "They want to go skiing, snowboarding or tubing. Believe it or not, it's hard to get people out here. If they don't see snow in their backyard, why would I want to go tubing? Who has snow? We've got plenty out here." Getting there is the biggest barrier now. Racine County started pre-treating roads on Thursday night in preparation for the snow on Friday night. They'll have crews working overnight to make sure their 1,000 lane miles of road are clear come Saturday morning. 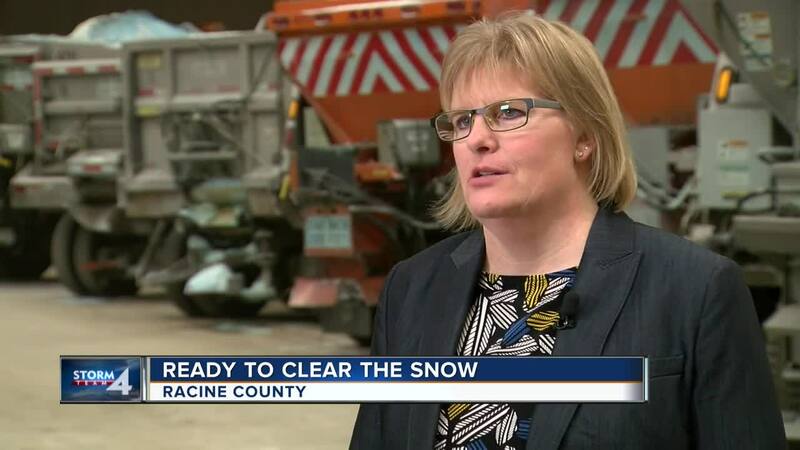 "People need to take their time," Julie Anderson, Director of Public Works and Development Services for Racine County said. "Have headlights on, make sure they're not following other vehicles too closely or following plows too closely. Make sure they really take their time getting to destinations. Things are going to be slippery as temperatures fall." Even for those getting cozy inside this weekend, those falling temperatures could cause headaches. With potential low temperatures in the single digits and high winds, it could be the perfect storm for pipes to burst. "We really need some really cold days, multiple days in a row," Jessie Cannizzaro, Master Plumber with Milestone Plumbing, Inc. said. "If the wind picks up, that's when we start to see a lot of frozen pipes start to break. That cold has to penetrate the walls of your house to get to those pipes." Cannizzaro says if you haven't turned off the water to your outdoor hose, now is the time to do so to avoid bigger issues. Inside the home, it's not as immediate. Older homes are more susceptible to pipe bursts. Properly insulated homes are generally fine with the temperatures expected this weekend. However, Cannizzaro has a few tips to make sure you don't have to call her next week. "Crank up the thermostat an extra five degrees," She said. "Yes, you'll pay for it on the energy bill next month but it may save you from a really expensive service call." Cannizzaro says if your water stops running because the pipes have frozen, open the cabinet doors to your sink. You can use a fan to direct warmer air towards the frozen pipes or, under a watchful eye, use a space heater to help warm them up. Also, using heat tape to put around pipes is a way to alleviate frozen pipes but it's usually a sign of a bigger problem you'll need to tackle head first in the spring. "Being proactive instead of reactive is the best," Cannizzaro said. "Get that heat in as soon as possible. Know where the main shut off valve is too. If one of those pipes suddenly breaks, get the water shut off as quickly as possible."